Alice Hoffman, Mike Snyder and Lynne Zielinski with EIS 3D Printed Model. 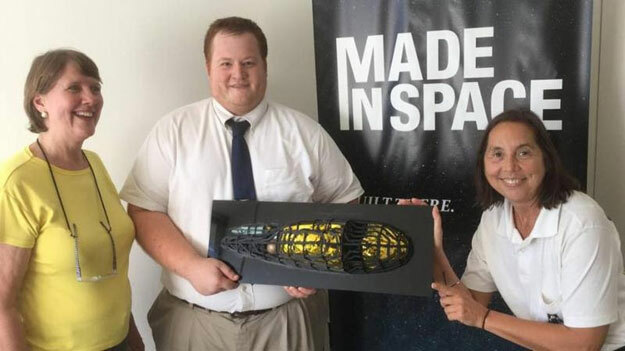 Enterprise In Space (EIS), an international project of the non-profit National Space Society, is excited to announce a partnership with Made In Space, Inc. to extensively use 3D printed components in a spacecraft to be launched into Earth orbit. This educational spacecraft will be the first real spacecraft bearing the "Enterprise" name. Once in orbit, the NSS Enterprise will not only be the first 3D printed airframe in space, but it will also carry more than 100 passive and active student experiments into space and back to Earth. Once complete, the NSS Enterprise will be the first 3D printed airframe bound for space, where it will likely achieve other firsts. The spacecraft will house space-focused projects from students at all educational levels hailing from all over the world. NSS Enterprise will communicate with the students about the status of their experiments using natural language via 'Ali,' a cloud-based artificial intelligence platform designed by Value Spring Technology, Inc. "Ali will be the voice and mind of the NSS Enterprise, communicating with her virtual crew just as the computer aboard the Star Trek ships did, in natural language, through the student teams' own internet terminals," said EIS Program Manager Alice Hoffman. "Through the EIS project, we hope to demonstrate that Ali can become a personal tutor and mentor to every student, allowing them to see the vision of a brighter future and providing them with the education to fully participate," she said. 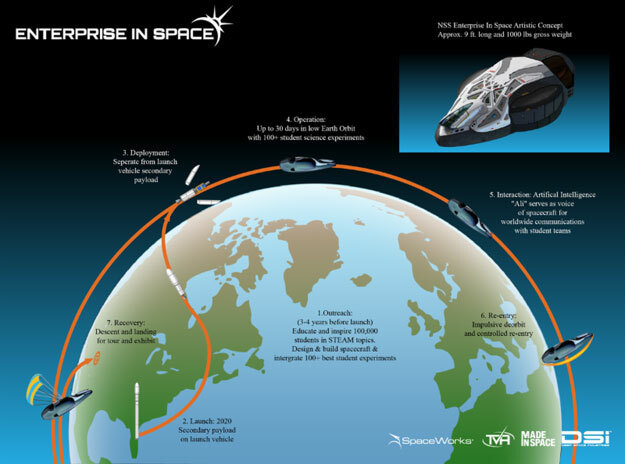 A Diagram Describing the NSS Enterprise from Enterprise In Space. The Enterprise In Space vehicle itself is an incredible technical challenge that will push the barriers of additive manufacturing and spacecraft design. The fully integrated vehicle will be unique and truly groundbreaking for the type of mission that is being undertaken. "Made In Space is excited to be a part of this great effort to engage with students from across the world through real experiments that will be flown in space on the NSS Enterprise spacecraft," said Made In Space Co-Founder and Chief Engineer Michael Snyder. "The EIS team is thrilled to be partnering with Made In Space," said Shawn Case, Enterprise In Space founder and chairman of the Board of Advisors. "It's a great fit, as we all work together to support and foster education. We share the same goal of enabling humanity's future in space. As Carl Sagan once said, 'Our species needs, and deserves, a citizenry with minds wide awake and a basic understanding of how the world works,'" he said. While EIS has secured $27.5 million in "in-kind" donations for the project, the organization will rely partially on public donations for the construction and launch of the orbiter. In addition to supporting student education, individuals who contribute will become virtual crew members by having their names sent into space and returned to Earth for display at a major museum. Larger donations from corporations, individuals, and foundations will be rewarded with branding rights for the spacecraft and the tutoring AI that will also be the voice and mind of the NSS Enterprise. The next phase of the design process is for the engineering development and specifications to be made from Von Medvey's design. Then construction on the vehicle can officially begin. EIS will also host international challenges to begin selecting K-12 and university experiments to be installed aboard the spacecraft. People may follow the progress of this historic EIS project - from winning entry, through engineering design, to construction and flight - at www.enterpriseinspace.org. About The National Space Society (NSS): NSS is an independent nonprofit educational membership organization dedicated to the creation of a spacefaring civilization. NSS is widely acknowledged as the preeminent citizen's voice on space, with over 50 chapters in the United States and around the world. The Society publishes Ad Astra magazine, an award-winning periodical chronicling the most important developments in space. To learn more, visit www.nss.org. About Enterprise In Space (EIS): The multi-pronged mission of the Enterprise In Space project is to design, build, fly, and eventually return to Earth an orbiter containing student experiments. This project will be a tribute to the many great visionaries of science and science fiction. It will demonstrate and pioneer new technologies while inspiring and encouraging space enterprise. It will promote the development of educational curricula and activities contributing to related future endeavors in science, technology, engineering, arts, and mathematics (STEAM). This project engages and inspires the next generation - all ages and walks of life - by igniting a renewed interest in space exploration and development. About Made In Space: Founded in 2010 as the world's first space manufacturing company, Made In Space, Inc. (MIS) has become a world leader in utilizing 3D printing for aerospace applications. In 2014, a NASA/Made In Space team sent the world's first 3D printer to the International Space Station (ISS). In partnership with CASIS, managers of the ISS National Lab, and Lowe's Innovation Labs, the disruptive technology hub of the Lowe's Home Improvement chain, Made In Space will be sending the first commercial 3D printer to the ISS next year. Additionally, the firm was recently awarded a NASA contract to 3D print and assemble structures in space itself.